This is it. The dealer just threw you the Queen of Spades to make your straight flush and the whale across the table just pushed you all in. What do you do? That's easy; you bet it all on Fender! Our dual-deck poker card set is amazing, the custom package includes two official poker-size linen playing card decks (no cheesy paper playing cards here). 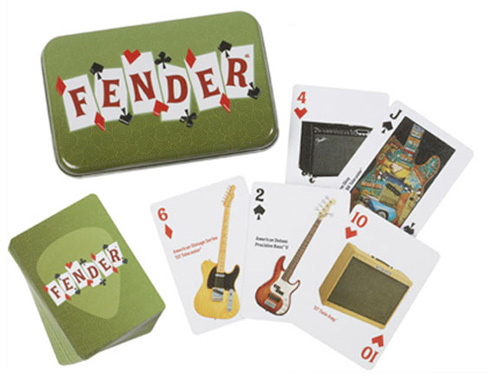 The decks span Fender's 60-year heritage, with each linen card featuring a cool Fender® instrument. Face cards and aces feature Custom Shop guitars in beautiful detail, and all cards are printed using a full four-color process, no two are the same! The set comes in an embossed four-color collector's tin. Yet another must-have from Fender! The set comes in an embossed four-color collector's tin.